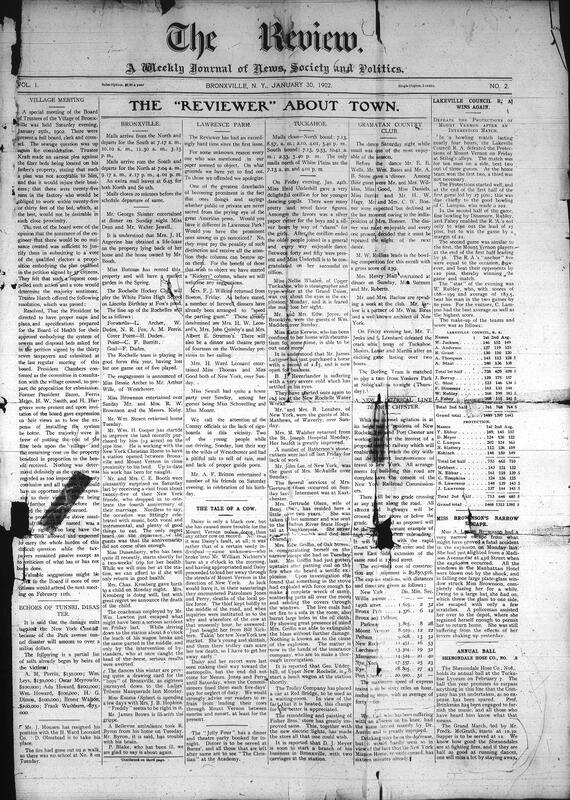 The Bronxville-Tuckahoe-Eastchester collection features nine newspapers from Bronxville, Eastchester, and Tuckahoe that were published between 1902 and 2009. The newspaper digitization project, underwritten by the Bronxville Historical Conservancy and Eastchester 350th Anniversary Celebration, was sourced from microfilm held by the Bronxville History Center, the Bronxville Library, and Eastchester Town Hall. 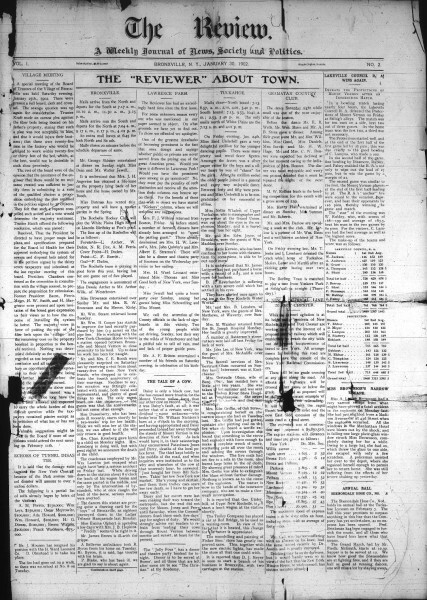 The newspapers are hosted on the Hudson River Valley Heritage website, news@hrvh.org. Under “Title,” click on the newspaper you wish to see. You may then search the full text, including ads, of all issues of the paper by entering a search term (put quotation marks around search terms of more than one word). Your search will bring up a list of pages on which the term appears. Click on your choice of pages, and the relevant newspaper page will appear with the search term highlighted. You can also search by issue date and read through each issue page by page. The Bronxville Review began publication in Bronxville, NY, on Thursday, January 23, 1902 as The Review, “A weekly Journal of the Town of Eastchester.” It was established by William Van Duzer Lawrence, the developer of Lawrence Park, a residential enclave overlooking Bronxville’s New York and Harlem Railroad station. Lawrence intended The Review “to expose to the tax payers . . . a ring of corrupt politicians who had long been preying on the public in the town of Eastchester.” Managed by Lawrence’s youngest son, Dudley B. Lawrence, the newspaper remained under the controlling hand of the Lawrence family as a voice in the village until early 1936. 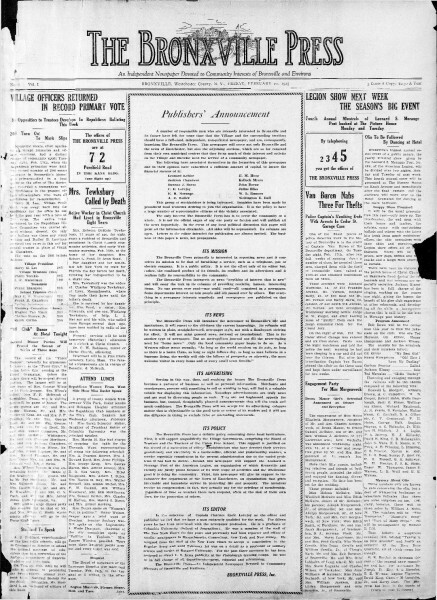 Launched as a Republican paper, The Review clashed with a pre-existing Democratic weekly, The Eastchester Citizen-Bulletin, published in Tuckahoe, NY., which was eventually absorbed by The Tuckahoe Record. The Bronxville Review carried news of Eastchester and Tuckahoe, but much of its focus was on Bronxville. It covered the separation of the Bronxville School District from the Tuckahoe District, the incorporation of Tuckahoe Village, and the construction of the Hotel Gramatan, Lawrence Hospital, single family houses, community houses, apartments, Bronxville’s central business district, and the Bronx River Parkway. Its social pages chronicled the life of Bronxville’s Lawrence Park art colony, which included artists Otto Bacher, Max Bohm, Walter Clark, Ann and Bruce Crane, Lorenzo Hatch, William Henry Howe, Charles Knight, Mary Fairchild Low, William Low, Spencer Nichols, Caroline Reed Parsons, Orrin Sheldon Parsons, Milne Ramsey, Herman T. Schladermundt, William T. Smedley, George Smillie and Robert Reid. 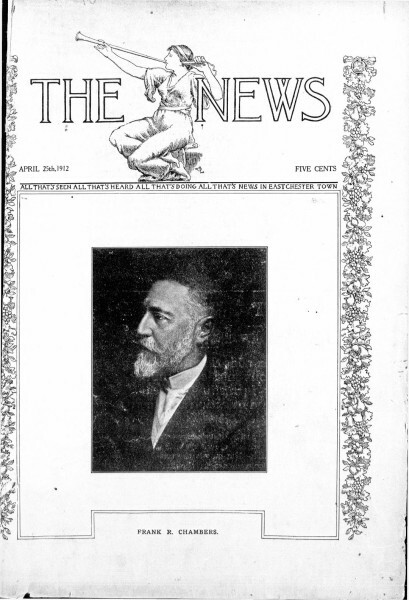 News articles reflected the work of architects active in early Bronxville, including William A. Bates, Lewis Bowman, William Winthrop Kent, George F. Root, Robert Scannell, Penrose Stout and Walter Wilder. Other prominent early residents covered by The Review included Bronxville President Frank Ross Chambers, Tuckahoe President Herbert D. Lent, Eastchester Supervisor Henry C. Merritt, General George Custer’s widow Elizabeth Custer, activist Amie Dusenberry, manufacturer H. Ward Leonard and horticulturist Louise Beebe Wilder. A short-lived Bronxville competitor, The News, was published from April 26, 1912 through September 26, 1913 by village residents who opposed Lawrence’s policies. In 1925 a group of Bronxville and Tuckahoe businessmen began publishing another competing paper, The Bronxville Press, to be an “independent, non-political newspaper” serving Bronxville, the town of Eastchester and adjoining areas. The Press was published weekly (1925-1926, 1935-1937) or twice a week (1927-1934) over the next 12 years. When Bronxville resident Richard H. Price bought and became publisher of The Bronxville Review in March, 1936, it was said to been under one ownership longer than any newspaper in Westchester County. The following year, Mr. Price purchased The Bronxville Press, and merged the two papers into the Bronxville Review-Press, effective Thursday, April 8, 1937. In January 1940 a new weekly competitor, The Bronxville Reporter, owned and staffed by Bronxville residents, was launched. It published until April 2, 1953 when the two papers merged under new ownership as the Review-Press and Reporter. It was purchased by the Gannett Company in April 1964 and continued publishing through 2009 (July 6, 2000 -2007 as the Review Press; 2008-2009 as the Review Press Express), after which it ceased publication as a stand-alone weekly.